Independence Day is one of my favorite holidays – and one of the things I think makes celebrating it so fun is the festive marches that are part of traditional 4th of July concerts and fireworks exhibitions. It is one of the few occasions when late 19th and early 20th century music is remembered and still part of popular American culture. In that spirit, here is a collection of such music recorded between 1909 and 1919. If you enjoy the selections here, be sure to also check out the posting I put up last July 4th featuring marches composed by John Philp Sousa as performed by Sousa’s own band. Last year’s posting is just as timely today as it was one year ago – which is one of the nice things about this kind of music. All of the songs here were written over 110 years ago – yet they are timeless. Also, if you enjoy these selections, check out the other posting I put up today of recordings from the flip sides of some of the records featured here that are also worth a listen but do not particularly fit this posting’s Independence Day theme. 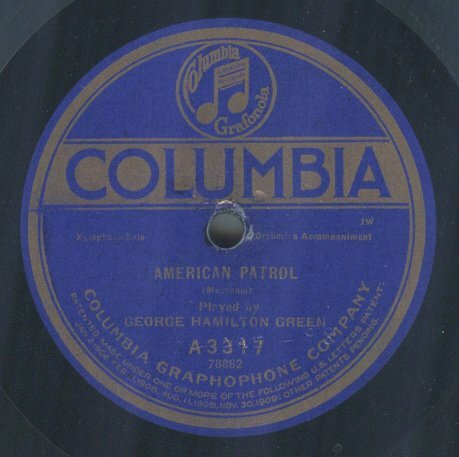 Many will be more familiar with our first selection “American Patrol” through the top selling 1942 swing version recorded by Glenn Miller’s orchestra. But the song, composed by Frank White Meacham, dates back to 1885. Here it is performed by ragtime era xylophonist George Hamilton Green with a military band accompaniment. “National Emblem March” was composed in 1902 by Edwin Eugene Bagley, though it was not published until 1906. Here it is performed by the United States Marine Band under the direction of German born conductor William H Santelmann who led the band from 1898 to 1927. A few decades later, his son William F Santelmann led the band from 1940 to 1955. Established in 1798, The United States Marine Band’s recording history dates back to the the early 1890s when it began making cylinder records for Columbia – it was the first well-known musical ensemble to make commercial recordings. Today, the band is the oldest continually active professional musical organization in America. “Bombasto March” was composed in 1895 by Indiana born composer Orion R. Farrar. It is performed here by Arthur Pryor’s band. Pryor had a long association with John Philip Sousa and, for a time, was a soloist and assistant conductor for Sousa’s own band. Because Sousa had an intense dislike for the phonograph and recorded music, a large number of the recording sessions by the John Philip Sousa band were, in fact, led by Arthur Pryor. 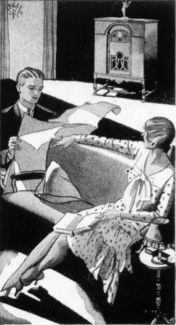 On the flip side, Deiro performs “Blaze Away March” which was published in 1902 and composed by Abe Holzmann who was best known as a composer of ragtime. Have a festive and fun 4th of July! This entry was posted in 1900s, 1910s, Acoustic Recordings, American Recordings, Military Band. Bookmark the permalink. Another Blaze Away rendition belonging here is that of Mike Bernard’s (A-2557), self-styled “Rag Time King of the World.” This title as well was a blue label Columbia of the American Patrol’s same era. You must have a copy somewhere, Dismuke. It sold very well, being a supreme exposition of just what can be done at ‘The 88′ with ten, then sounding like A HUNDRED!. To the best of my knowledge I do not have a copy of Bernard’s “Blaze Away.” Then again, it is possible that I have it and it is sitting in a box of yet to be sorted through records. Sounds like it would be an interesting record – thanks for telling me about it. I will definitely keep my eyes open for a copy.